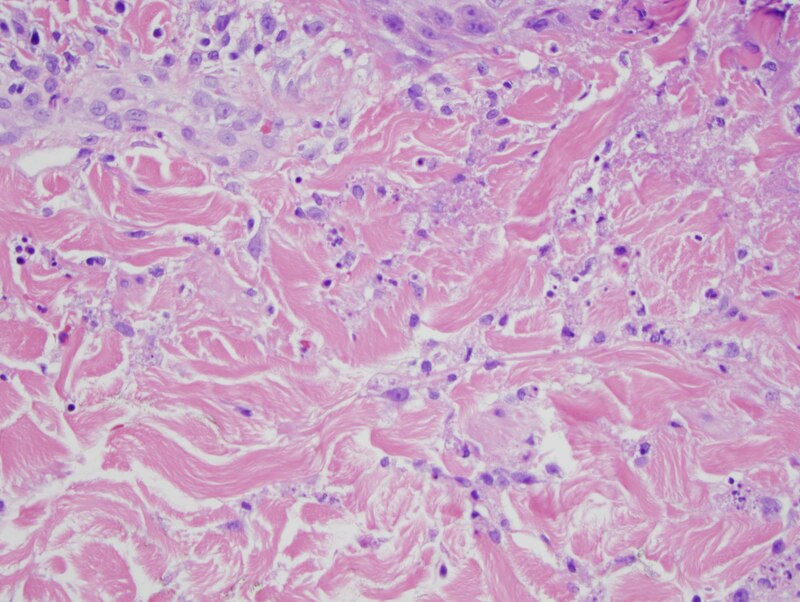 Given the papular nature of the skin rash noted clinically along with the histopathology showing a dermal neutrophilic infiltrate with focal spongiform pustulation and areas of neutrophilic interface dermatitis, the findings would be considered diagnostic of pemphigus herpetiformis. 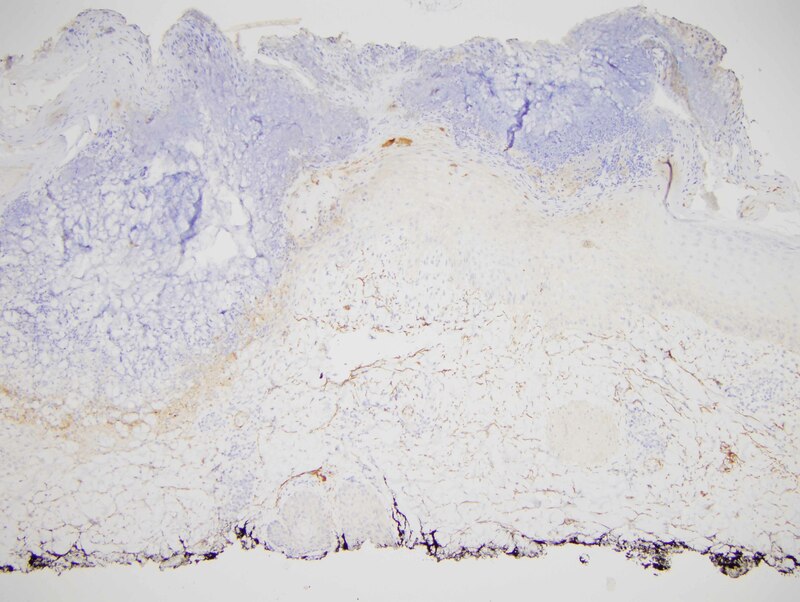 It is a very uncommon the distinctive variant of pemphigus representing less than 10% of all cases of pemphigus, representing an excellent prognosis variant of pemphigus. 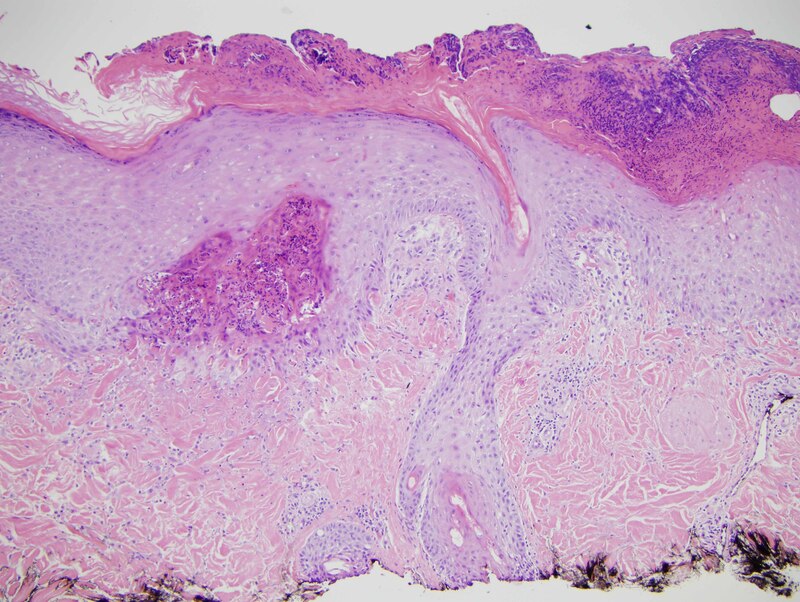 Clinically the lesions are defined as widespread erythematous to vesicular papules with a tendency to assume a grouped and annular morphology although not in every case. There can be intense pruritus in 50% of cases. A mean age of onset of 65 years has been recorded. Oral and other mucosal involvement is extremely uncommon. Most patients do not progress to pemphigus vulgaris or pemphigus foliaceus. 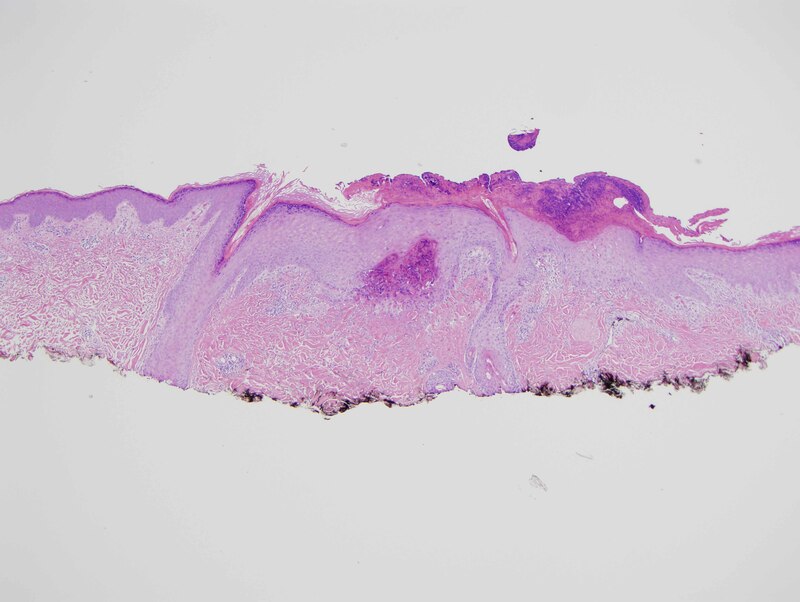 A diverse histomorphological pattern can be observed including eosinophilic spongiosis, intraepidermal and subcorneal microabscesses containing neutrophils and eosinophils with variable dermal neutrophilia as noted in this case. Acantholysis may not be observed. The target antigens are varied and include desmoglein 1 and 3 and desmocollin 1 and 3. The blister inducing activity of the IgG mediating pemphigus herpetiformis may be less. The patient's history of pemphigus vulgaris in the grandmother is of great interest. 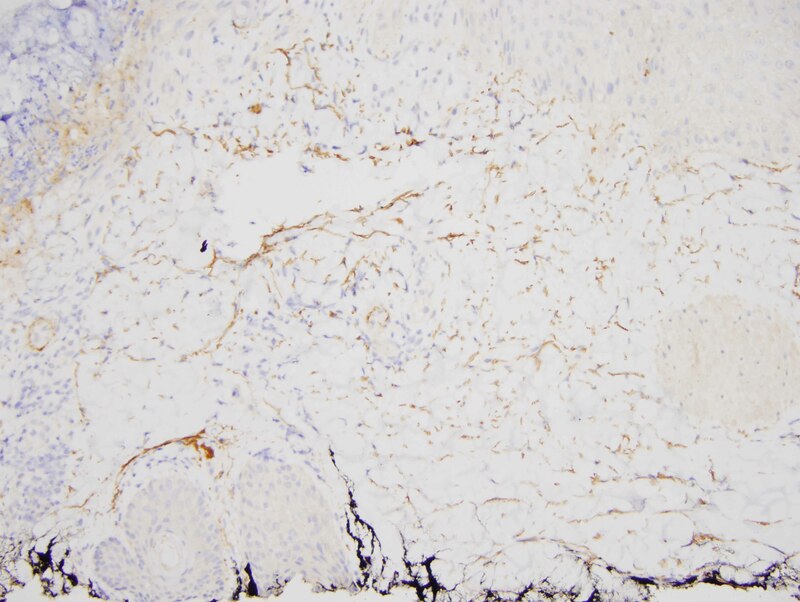 In addition, the patient was on a serotonin reuptake inhibitor which does have immune dysregulating properties and can evoke an autoimmune diathesis and indeed pemphigus herpetiformis has been linked with drug intake. 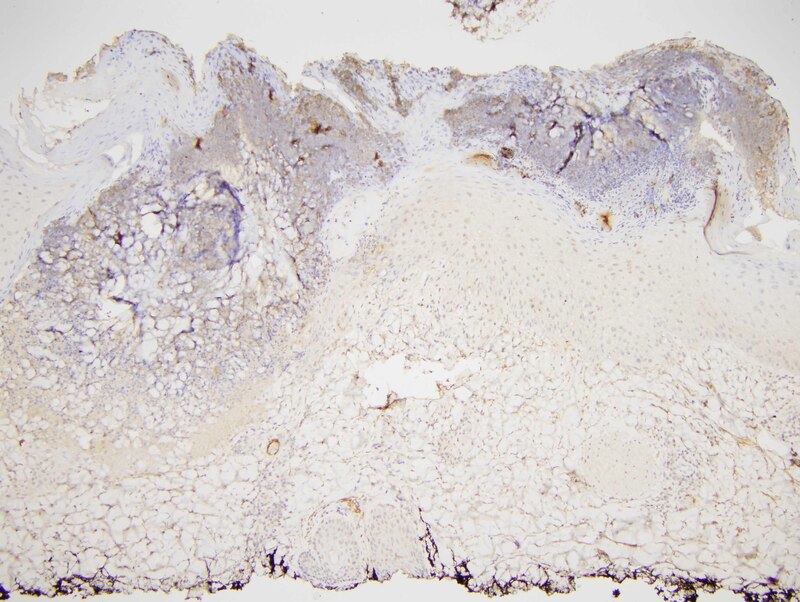 Perhaps this patient developed pemphigus herpetiformis because of the use of the immune dysregulating drug in concert with a genetic predisposition for pemphigus.